A video about a well-known Soviet actor of African descent Tito Romalio, who was murdered in St. Petersburg, Russia in 2010. The installation will also include a pile of pocket-size take-away calendars, on which the date of Romalio’s death will be marked in red. Ivan Brazhkin (1985 -, Rostov-on-Don, Russia) is an artist and political activist who lives and works in Moscow. He started as an experimental poet and musician. He has been participating in exhibition projects in Russia and abroad since 2002. In the period 2002 – 2004 he participated in various actions of the Radek community (Moscow). He cooperates with various leftist political organizations. 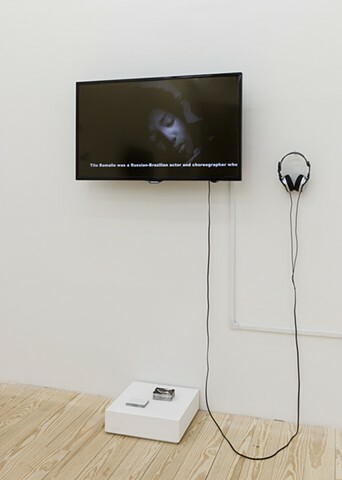 Brazhkin works with different media, from video and installation to graphics and sculpture.